A range of thermometers that will give fast accurate temperature readings at prices that won't break the bank. We offer a carefully selected range of general purpose digital thermometers from various different manufacturers such as Brannan, Comark, Hanna and TME, that will give fast accurate temperature readings at prices that won't break the bank. Our general purpose digital thermometers are excellent value and are ideal for use in catering establishments including cafes, coffee shops, restaurants, and care homes as well as in the home. They can be used for cooking, baking, frying, food storage, and for heating and cooling liquids. We offer a wide range of designs, such as traditional hand held, pocket style, pen shaped, T-shaped and folding probe. Most of the thermometers within this range are supplied with either, belt clips, stands, or wall mounting facility. 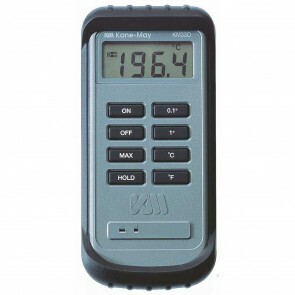 The thermometers in this range all offer slightly different specifications and features. Some of the features available in this range of thermometers are usually only found in more expensive instruments. These include temperature alarms, max/min recording, fast response probes, water resistance, heat resistance, high accuracy, extra long probe etc. Many of our Comark thermometers for instance have the added benefit of BioCote® antimicrobial protection whilst our Hanna Checktemp has a very useful self calibration feature. We regularly have special offers on thermometers in this range, so pick up a bargain today!